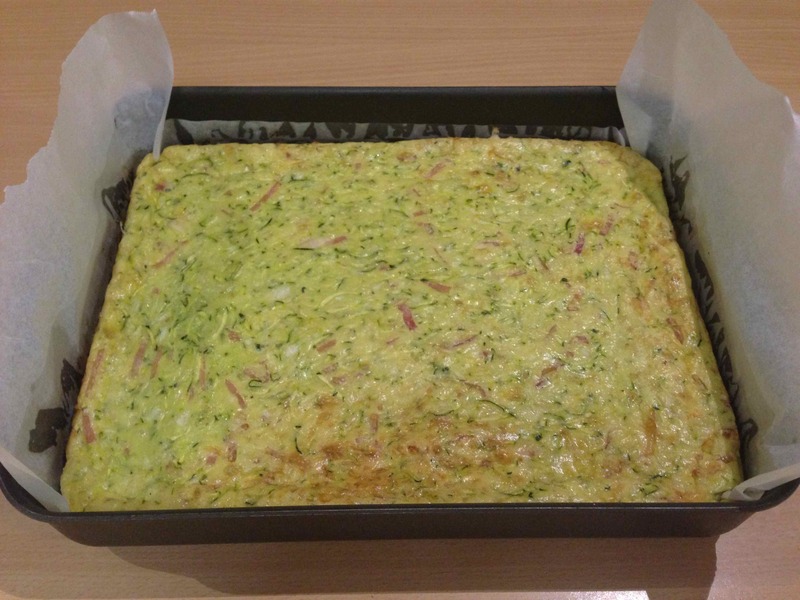 Zucchini Slice has got to be one of my favourite money saving meals and it gets a regular workout around here in the summer months. Rather than spending money on expensive meat for a barbeque when having people over, I often choose some good quality sausages to cook on the barbie accompanied by Zucchini Slice and a fresh salad. As well as being so affordable, this little number has two other benefits: first, from dicing the onions to chopping the bacon, to whisking the eggs and grating the cheese, it can all be made using various blades of the food processor. Second, it can be made up to a couple of days ahead and stored in the fridge to avoid cooking stress on the day your guests come over. To make this slice, originally from the Women’s Weekly, using the quantities that follow, costs around $6 and serves 6+. The photo above is a double quantity which neatly fits a roasting sized dish. Grate unpeeled zucchini coarsely, finely chop onion and bacon. Combine zucchini, onion, bacon, cheese, SR flour, oil and lightly beaten eggs, season with salt and pepper. Pour into a well-greased or baking paper lined lamington tin 16cm x 26cm, bake in a moderate oven for 30-40 minutes or until set and browned.